JOHN M. BECKER, editor in chief of THE BILERICO PROJECT, celebrated his 30th birthday on March 1, 2015. To celebrate, he posted on WWW.BILERICO.COM that he was taking the day off. BOSTON SPIRIT MAGAZINE celebrated its 10th anniversary with its March/April 2015 issue. DBQ, a nationally distributed bimonthly based in Indianapolis, entered its fifth year of publication with its December 2014/January 2015 issue. GAY LIFE, based in Baltimore, launched a new, regular column, the GLCCB Board Spotlight. THE GLCCB — the Gay, Lesbian, Bisexual, Transgender Community Center of Baltimore and Central Maryland — publishes the monthly newspaper. Each month in the new column, newly elected board vice president KRISTI METZGER will interview members from the center’s board of directors. GEORGIA VOICE, based in Atlanta, celebrated its fifth anniversary in March 2015. THE NATIONAL LESBIAN AND GAY JOURNALISTS ASSOCIATION (NGLJA) has launched a new Ally Membership for $75 per year. The new Ally Membership is for anyone who believes in NLGJA’s mission but are not current, former, full-time or part-time journalists (or other media-related fields). This is in preparation for NLGJA’s 25th anniversary celebration later in 2015. OUTFRONT COLORADO, based in Denver, bid farewell to its graphic designer COLBY BURMIT, who is leaving to pursue other artistic opportunities. 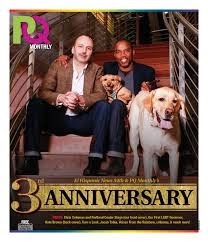 PQ MONTHLY, based in Portland, Ore., celebrated its third anniversary with its February/March 2015 issue. SHE MAGAZINE, based in Davie, Fla., celebrated its 16th anniversary in February 2015. UNITE MAGAZINE, which already publishes Indianapolis, Nashville and Business editions, launched its Cincinnati edition with its premier March/April 2015 issue. Here Media Inc. has rebranded its popular HIV Plus magazine, the country’s largest publication aimed at people with HIV and those who care about and for them, as Plus. The new Plus brand, which launches with the magazine’s May/June 2015 issue, aims at removing the stigma that oftentimes affects people living with HIV /AIDS. By eliminating the stigmatizing language from its title, Plus lets its readers know that it understands them as more than just their status. Plus tells its readers, “You are you, plus a little something more,” according to a press release. As she explained in an opinion piece, published on the magazine’s website, “When HIV Plus magazine was founded in the 1990s, AIDS was at pandemic levels, HIV was a virus that researchers knew little about, and few people with HIV were expecting to live long, healthy lives. Today, as we publish issue 106, the landscape has changed and so have people living with or affected by HIV. Now the virus is like other manageable chronic conditions that require daily medications, much like diabetes, and people with it are living as long as their HIV-negative peers. They are often dealing with co-infections, like hepatitis C, and social stigma more troubling than the actual virus. HIV Plus’ award-winning online content will continue to be found at HIVPlusMag.com. The brand will also continue to publish its mobile app, the HIV Plus Treatment Guide, a comprehensive look at the medications approved by the Food and Drug Administration to treat HIV and opportunistic infections, as well as a state-by-state map of drug assistance programs, complementary therapies and drug trials. HIV Plus reaches more than a quarter million readers each month with print and digital magazines, its website, and the HIV Plus Treatment Guide mobile app available on iTunes and Google Play. Gaycation, a national monthly magazine about LGBT travel, has acquired The Word, an Indianapolis-based LGBT tabloid, and its sister publication, Up Downtown, from longtime owner and publisher Ted Fleischaker. The Word will remain headquartered in Indianapolis and will continue to be focused on serving the needs of the LGBT community in the region. The Word is Indiana's only gay newspaper. Founded in 1991 to serve just Indianapolis, it's now available in 7 states, including Indiana, Illinois, Michigan, Kentucky, Tennessee, Ohio and Iowa. Up Downtown covers the downtown area and provides downtown residents with the latest happenings. “I really am proud to have started something such as these two publications, which have seen such widespread success,” said Fleischaker in a press statement. Based in New York City, Gaycation Magazine (www.gaycationmagazine.com) publishes 10 issues a year and is focused on the sophisticated LGBT travel market. The acquisition will extend Gaycation Magazine’s domestic media platform, particularly in the Midwest, helping to fuel its growth strategy. The deal will complement both publications by expanding key content vertically while also accelerating the digital evolution of both companies. “The Word and Up Downtown are a perfect fit for our growing portfolio of news and travel media assets, and the name and rich heritage of both titles will be preserved independently, vastly expanding our overall print and digital platforms and extending our reach across the growing LGBT market,” said DJ Doran, publisher of Gaycation Magazine, in a statement. In another move, Gaycation has also acquired Sydney, Australia-based Rainbow Tourism (www.rainbowtourism.com). Founded in 2005, Rainbow Tourism grew from a few individual regional websites covering the South Pacific and Southeast Asia into a global umbrella site. Over the past decade, it has amassed thousands of pages of original content highlighting experiences and events for gay and lesbian travellers. Celebrating its 10th anniversary this year, Rainbow Tourism has earned its reputation for exceptional travel content. "It has been a labor of love by a team of gay travellers about the places we know and places we go for work and play," said Mark Proffit, director and technical editor, in a statement. “Early on we adopted a motto and lived by it: 'Go gay. Stay gay. Play gay.'" "We are thrilled that Gaycation Magazine and Rainbow Tourism embrace the same passion for delivering original and relevant travel content for our community. This latest addition substantiates our sheer determination to expand through strategic acquisitions that focus on the LGBT market," said Gaycation publisher Doran. Interview with editor and publisher Steve Elkins. He is executive director of the Camp Rehoboth Community Center, which publishes the magazine. Geographic coverage area: The primary coverage is the coastal area of southern Delaware, although issues are also distributed in Philadelphia, Baltimore, and Washington, D.C.
Staff size and breakdown [writers, sales reps., etc. ]: Editor, production designer, advertising rep and administrative assistant are responsible for producing each issue. We have approximately 12 writers who are regular contributors. Physical dimensions of publication: Magazine-style (8¼” x 11”) on 50-pound bright white paper. Key demographics: Rehoboth Beach is one of the premier LGBT resorts on the Atlantic Coast. Known as “The Nation’s Summer Capital,” we are the closest beach to Washington, D.C., Baltimore and Philadelphia. Based on the membership for CAMP Rehoboth, we estimate that our readership is approximately 70 percent LGBT and 30 percent straight. Print run: 6,000 per issue. 15 issues per year — monthly from February to April, biweekly from May to August, and monthly from September to November. We do not publish in December or January. Website: www.camprehoboth.com. Issues since 1997 are archived on our site. Press Pass Q: What section in Letters from CAMP Rehoboth is the most popular? Elkins: CAMPshots, our 8-10-page photo coverage of local events, parties, restaurants/bars; Before The Beach, interviews with locals about what they did before moving to the area; features editor Fay Jacobs' "Rehoboth Journal;" and CAMPmatters, community and CAMP Rehoboth related stories and commentary. Elkins: My favorite story is from the late 1990s. I was coming out of the Rehoboth Beach Post Office when an older woman — who I realized was Evelyn Thoroughgood, the unofficial historian of Rehoboth Beach — stopped me and asked if I was THAT person who printed THAT gay magazine. I said, “Yes, Mrs. Thoroughgood, I’m the one.“ Her response was that she was unhappy that we took a printing break in December and January. She thought we should publish all year long. You can never tell where your fans might be. PPQ: What challenge or challenges has the publication had to overcome? Elkins: Letters from CAMP Rehoboth is a program of CAMP Rehoboth, an LGBT non-profit organization serving the Rehoboth area. Both the organization and its magazine are celebrating its 25th anniversary this year. For all of those years, we have tried to make sure that the magazine serves both the mission of CAMP Rehoboth and the needs of the community. That can be challenging at times. Elkins: Right now, the organization and the production are still managed by the founders of the organization. We have a succession plan in place, but making sure that when the time comes, there are new leaders in place to carry on its work is always a part of the planning process. PPQ: How has Letters from CAMP Rehoboth changed since it was first launched? Elkins: The first issue was nothing but a four-page newsletter with only a couple of advertisers. In fact, one of the local gay businesses was afraid to advertise in it because they thought it might be too gay. PPQ: What one change are you planning to make? Elkins: We are constantly working to find ways to engage younger members of the LGBT community — through the ever-evolving social media — while not alienating our older audience. Our goal this year is to find a writer who can be the voice of that new generation. Elkins: We are, but in a very gentle way. The success of CAMP Rehoboth, and our magazine, comes from our constant efforts to build connections with all the organizations in our area — as well as our relationship to people from the large East Coast cities nearby who make up our readership. Located right in the middle of downtown Rehoboth Beach, both the CAMP Rehoboth Community Center and our magazine are visible role models for a world where gay and straight live side by side. 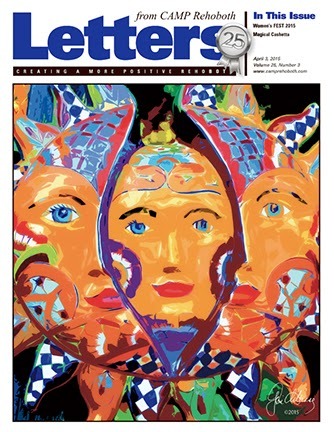 Elkins: Perhaps more inspiring than surprising, Letters has generated some very moving responses over the years — sometimes from LGBT people who needed positive role models and sometimes from straight supporters and readers learning how to deal with gay family members or any number of other issues. PPQ: What is the biggest story or stories Letters from CAMP Rehoboth has covered in the past 25 years? Elkins: Marriage equality. Delaware was one of the first states to allow civil unions and the 11th state to pass marriage equality. Plus, Delaware has passed laws covering gender identity and employment non-discrimination. Elkins: It’s a rapidly changing world, but the more visible LGBT people have become, the louder our opponents are shouting. With social media, those extreme reactions are broadcast everywhere. We must continue to build a supportive environment for creating positive change, even in today’s world.